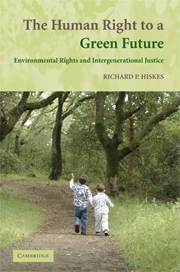 This book presents an argument for environmental human rights as the basis of intergenerational environmental justice. It argues that the rights to clean air, water, and soil should be seen as the environmental human rights of both present and future generations. It presents several new conceptualizations central to the development of theories of both human rights and justice, including emergent human rights, reflexive reciprocity as the foundation of justice, and a communitarian foundation for human rights that both protects the rights of future generations and makes possible an international consensus on human rights – beginning with environmental human rights. In the process of making the case for environmental human rights, the book surveys and contributes to the entire field of human rights theory and environmental justice. Richard P. Hiskes is Professor of Political Science and Senior Political Theorist at the University of Connecticut. He is the Editor of the Journal of Human Rights and Associate Director of the Human Rights Institute. He is the author or co-author of four other books, most recently of Democracy, Risk, and Community: Technological Hazards and the Evolution of Liberalism (1998). Professor Hiskes has published works on a variety of topics within political theory, human rights theory, environmental ethics, and science and technology policy. He has published articles in many journals, including Review of Politics, Human Rights Quarterly, Public Affairs Quarterly, Human Rights Review, Hume Studies, Women and Politics, Policy Studies, and others. Winner of the 2010 American Political Science Association award for Best Book in Human Rights Scholarship.